There's been an explosive growth in smartphone app usage, despite federal finger-wagging over marijuana. This column is culled from our blog of the same name. Medical cannabis patients are increasingly turning to their smartphones to easily find deals of the day, scan dispensary menus, and even schedule some dispensary-provided yoga. A tour of the Apple App Store and the Android Market reveals a rapidly advancing world of weed apps amid the crackdown by the US Department of Justice. Whether it's studying up on strains, finding a physician who specializes in the medicinal herb, staying informed, or ending prohibition, the needs of the medical cannabis industry are playing out on mobile technology. Leafly: On January 26, classy strain encyclopedia Leafly launched the free Android version of its free iPhone app, which rounds out Leafly's digital presence since the eighteen-month-old business reset the bar on site design. The Orange County company reports 1,000 app downloads a day, and 40 percent of those downloaders convert into weekly Leafly App users. In the last 30 days, iPhone users have looked at 500,000 strain reports and 50,000 photos. The site started with 50 official strain reviews and is now up to 520, plus some 2,500 less-detailed entries. More than 17,000 reviews have been posted and 2,000 strain pics have been uploaded since Leafly launched the feature. The three coders who started Leafly have quit their day jobs, hired three more employees, and are in the process of hiring five more. The October crackdown has been the biggest hurdle for the growing company, said Scott Vickers, Leafly co-founder and developer. "It's a weird kind of time but it's exciting," he said. "The uncertainty in the market seems to have driven patients our way in search of more information." 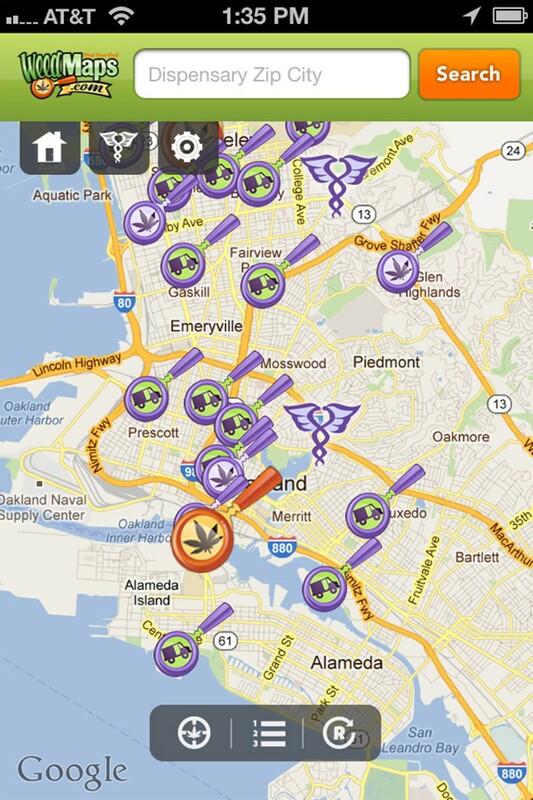 LegalMaps (iOS)/WeedMaps (Android): The free mobile version of WeedMaps.com has been downloaded around 250,000 times for Android and 350,000 times on iPhone. "We get more traffic to the website through Android and iPhone than we get through just the website now," said site cofounder Justin Hartfield. WeedMaps boasts a massive national dispensary database with menus that the company updates frequently. Travelers often use it to find new clubs, and then review their experiences. Even with the crackdown, LegalMaps is seeing more downloads and should soon edge into the top 25 medical apps in the App Store. Harborside Health Center: The West Coast's largest dispensary has a free app to match its stature, garnering 4.5 out of 5 stars in the Apple App Store based on 69 reviews since its April 20 update. HHC's massive menu is on the app, but the catch here is that products sell out faster than the inventory management system can keep track of them, so don't rush down to the dispensary with one thing in mind. The app's piped-in Twitter feed is a better source for up-to-the minute inventory. Users can also check the app's Deal of the Day for specials like "Free $15 hash with $150 purchase." Harborside's robust patient services calendar is accessible as well, helping patients schedule reiki, naturopathy, yoga, and acupuncture services. The Vapor Room: The Haight Street institution in San Francisco just overhauled its Facebook presence and partnered with The Bold Italic and Noise Pop on a pop-up shop (we've always liked their style). A sort of clone of the HHC app, The Vapor Room's free app (and eight others) are powered by San Francisco company MyDispensaryApp, a subsidiary of medical cannabis angel investor network The ArcView Group, headed by Troy Dayton, who is also the co-founder of Students for Sensible Drug Policy. Dayton tells Legalization Nation that MyDispensaryApp was created to serve Harborside, but the demand for apps surprised the angel network and taxed its resources. "They just took off," Dayton said of the apps. Dayton also said that MyDispensaryApp was recently acquired for an undisclosed sum by Los Angeles company StickyGuide.com, a leading dispensary profile directory with menus. StickyGuide owner Nick Miller said that even mom-and-pop shops have real-time inventory needs, much like Apple's Mac store. When clubs run out of advertised product by the time the patient arrives, it infuriates them. "The inventory is so boutique. All these products are different and in such limited supply that it adds a whole other level of urgency to it," Miller said. "So many people are checking menus every hour for new stuff and rushing down there trying to get it before it sells out." 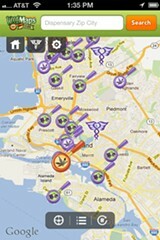 StickyGuide intends to cut app development costs for dispensaries and improve on what MyDispensaryApp built. Planned features include online ordering, so reserving that hot strain is just a click away. The cannabis app space is still a veritable green field for developers, Miller said, though the October crackdown "shook everyone up," he said. "It's two steps forward, one step back. "The short term might be iffy but the long term has never been better," Dayton added. Americans for Safe Access: "Call your Congressperson" features for the organization's iPhone and iPad apps are just the beginning of tech-enabled activism.